Your gear closet may be overflowing, but upgrades may be in order. Check out some notable gear seen at the Outdoor Retailer trade show this past July. Most of the show focused on upcoming rollouts for spring and summer 2018, but some of the goods will be available soon or are already out for consumers. In support of public lands conservation, big-name retailers like Patagonia and Arc’teryx did not actually attend Outdoor Retailer for its last Utah show (Denver will host Outdoor Retailer beginning January), but the companies are still on track to come out with some exciting gear in spring of 2018. You may know Tecnica for ski boots, but the company’s new Forge collection of trekking boots combines a precise anatomical fit right out of the box with effective heat moldable customization capabilities. Forge offers a fully heat moldable customizable, personalized fit that can be achieved in only 20 minutes at selected specialty retailers. Other features include an overlapping cuff, self-locking lace design, Gore-Tex liners and a Vibram Megagrip outsole. For more information, visit http://www.tecnicausa.com. Light, warm and highly compressible, the Cerium SL Hoody (SL = Superlight) is the ideal insulation for mountaineering, fastpacking or any summer activity where weight is a factor. Built with a very lightweight 100-percent nylon face fabric with a durable water repellent finish, the Cerium SL Hoody features high warmth-to-weight 850-fill European grey goose down that strategically places down and Coreloft synthetic insulation in areas where moisture may build up. For more information, visit http://www.arcteryx.com. The trim fitting Atom SL Vest weighs only 140 grams and compresses down into its own pocket to fit easily into a small waist pack or running vest. It features the lightest weight Coreloft Compact synthetic insulation and is designed to dry quickly and retain warmth in humid and wet conditions. The vest features a wind-resistant and durable water repellent treated main body with air-permeable fleece side panels for ventilation. It’s versatile and insulating, so ideal for chilly summer mornings and evenings. For more information, visit http://www.arcteryx.com. The newest XA shoe blends a smooth forefoot flex with a very supportive heel for control and comfort on technical terrain. The midsole is lightweight and durable for good energy return. These shoes will be fully released in February of 2018, but REI will have them beginning December. For more information, visit http://www.salomon.com/us/sport/running. For runners who need a little more assistance from their daily training shoe, the Sonic RA Max offers a comfortable, dynamic ride along with added cushioning and confidence to help you put in the miles. Rubber outsole with Wet Traction Contagrip makes for grip and stability in all terrains. For more information, visit http://www.salomon.com/us/sport/running. New for 2018, this board enables you to explore even the most remote locations with a partner. The latest addition to the Voyager lineup is the Tandem, tailored to the needs of two explorers (plus a third small companion with the removal of the central cargo points) who want to carry their kit along with them on their adventure. The 15-foot board features seven carry handles and two luggage spaces with tie-downs to keep everything secure. For more information, visit http://www.redpaddleco.com. 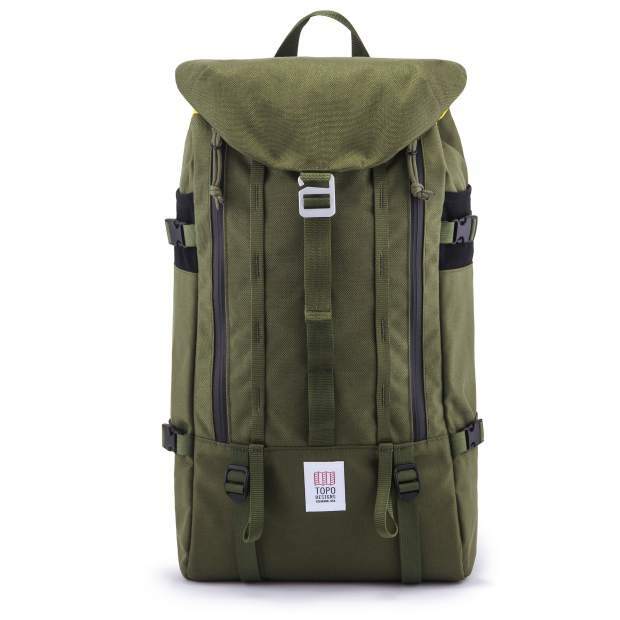 This pack can be used as an everyday carry or a weekend warrior. Durable, lightweight and comfortable, the Mountain Pack is just as at home on a climbing trip as it is on a work trip. Large side pockets fit a 32-ounce Nalgene, and the durable daisy chain exterior webbing is perfect for securing extra gear or attaching a bike light. For more information, visit http://www.topodesigns.com. By using an innovative external frame construction that creates low weight-to-volume ratio, the new Arc’teryx V Series duffels are designed for efficiently transporting equip-ment for gear-intensive adventures, allowing travelers to bring more tools with less total luggage weight. By utilizing a unique external frame, these duffels increase the overall useable capacity without adding material weight, avoiding costly overweight baggage fees without leaving essential gear behind. Available in 80 liter and 110 liter. For more information, visit http://www.arcteryx.com. The Bolten SL is a traditional mummy shape bag (insulation on the bottom of the bag without the pad sleeve) with stretch side panels that feature Primaloft Gold Active insulation for increased range of motion and comfort. With this design, overall mobility com-pared to other mummy bags is drastically increased. The bag weighs 2 pounds, 15 ounces. For more information, visit http://www.big agnes.com. The minimalist, single-pole architecture is the lightest two-door backpacking tent by Big Agnes. It features two vestibules and discrete seams and zippers for a clean, sleek look. For more information, visit http://www.bigagnes.com. This product came out recently, but it will still be the top of the line for spring 2018. The Goal Zero Yeti Lithium has built-in surge allowances and multistage protection, creating compatibility with more devices ranging from lights to laptops, refrigerators to power tools. For more information, visit http://www.goalzero.com/yeti/. This new seamless bootie innovation is the standout feature of these ultralight packable waders from Patagonia. They are built for long treks to remote water, for warmer weather and for streamlined travel. Single-seam construction creates durability, with a gusseted crotch for freedom of movement. The waders pack into a compact 8-inch-by-13-inch stuff sack, with a total weight of 1 pound, 10 ounces. For more information, visit http://www.patagonia.com. Built to take on the worst downpours, the StormLine Stretch Rain Shell is a fully featured rain shell. By combining Black Diamond’s own BD.dry waterproof and breathable solution with a full feature set and highly stretchable fabric, the StormLine provides reliable protection when the weather breaks. For more information, visit http://www.black diamondequipment.com. This Colorado company has come out with a pair of pants that are as resilient as your adventures and your work ethic. They are American-made 12-ounce duck canvas, with double-front panels and triple-stitched seams. These pants will protect you from coarse rocks and harsh winters, while clean lines and a streamlined fit keep you looking sharp around town. For more information, visit http://www.topodesigns.com. Black Diamond built this shoe for comfort in mind, as well as performance. Engineered knit technology creates for breathability, paired with the innovative NeoFriction molded rubber. This is the perfect entry-level rock shoe for all day comfort at the gym or crag. For more information, http://www.blackdiamondequipment.com. The Panga Submersible Duffel is a non-insulated duffel bag designed for adventures like extended backcountry stays, fly-fishing and river trips. The airtight closure makes this bag absolutely waterproof and keeps moisture out. For more information, visit http://www.yeti.com. The exterior fabric is tough, and the straps and accompanying lash points that make it easy to haul. The YETI Panga is available now in 50-, 75- and 100-liter siz-es.